With the holidays quickly approaching, I have been busy looking for healthy snacks and appetizers to serve when entertaining, or simply when the family are all together. Our family love their snacks, and I like to have a few easy options that I can throw together quickly that will appeal to kids and adults. 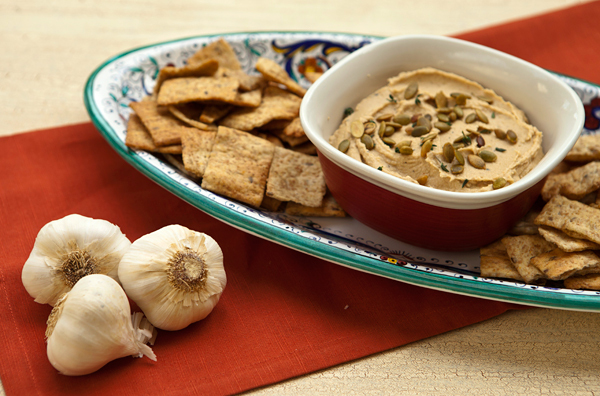 Healthy dips like this easy hummus are a great choice, as you can serve them with healthy whole grain chips, or raw veggies. Hummus is simply a creamy bean dip usually made with garbanzo beans and flavored with Tahini or sesame paste that can be flavored with many other ingredients. 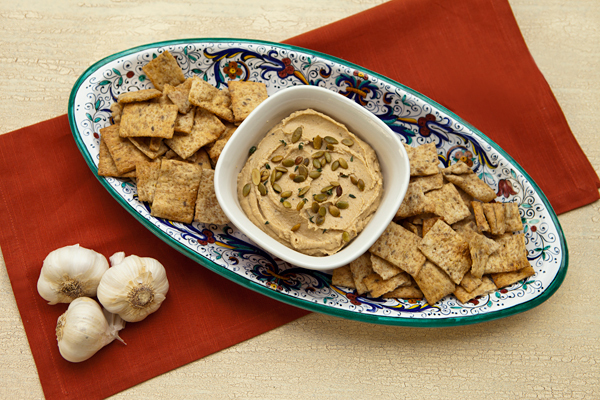 In this version, I used roasted garlic cloves to flavor the hummus, which adds a subtle sweetness that is very flavorful. Roasting garlic completely changes the flavor of this kitchen staple, turning it into a creamy, subtly sweet spread that is great slathered on crusty bread. Roasted garlic is also a great ingredient to use in flavoring dips, or mashed potatoes. I will be honest, and when I first made this dip, I kept tasting it and thought it didn’t have enough garlic so added extra. The garlic flavor really does intensifies as it sits, so after a couple of hours the garlic flavor in the dip was actually too strong. The next time I made it I reduced the amount of garlic, and after being refrigerated for a couple of hours the flavor was perfect. I serve this hummus with whole wheat pita chips, along with celery and carrot sticks. Dried beans rock as they are packed with fiber, protein, folate & hard-working phytonutrients. This recipe uses much less oil than most hummus recipes though doesn’t sacrifice any flavor. Slice off the top of the pointed end of each head of garlic, and place the garlic in a small casserole dish. Drizzle with the oil, cover with foil, and bake until the garlic is soft, about 30 minutes. Place the garbanzo beans, lemon juice, sesame paste, salt, pepper, red pepper flakes in a food processor and pulse. Squeeze the garlic into the food processor and pulse again until blended. Drizzle in enough water until the texture is light and fluffy. 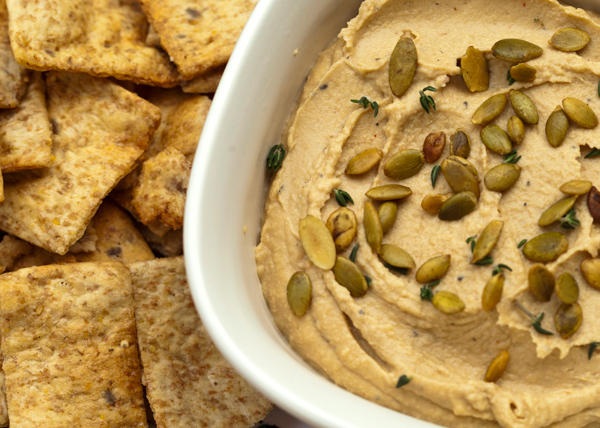 Place the hummus in a serving bowl and top with pumpkin seeds or chopped fresh herbs. Serve with whole grain chips or crudites.